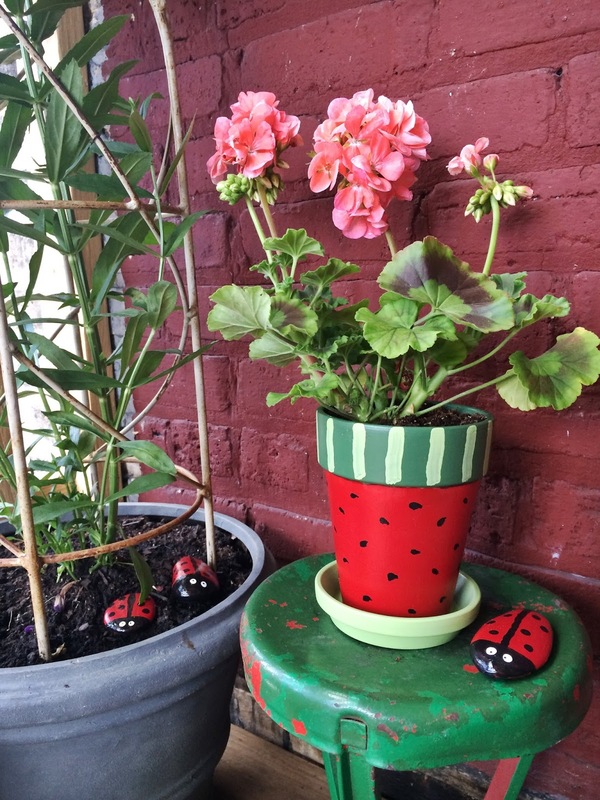 There are certain foods that just scream summer to me- BBQ, corn on the cob, pasta salads to name a few and WATERMELON! 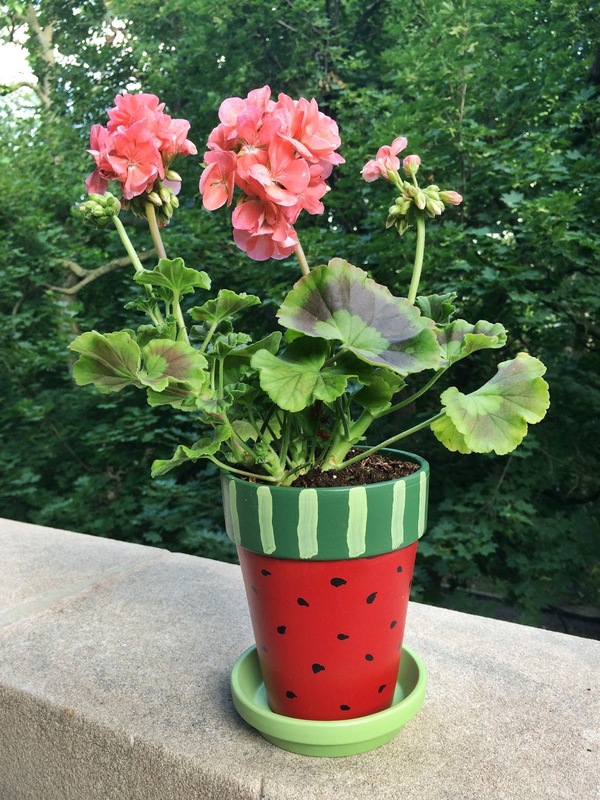 That’s why this watermelon inspired pot is the perfect craft for summer. 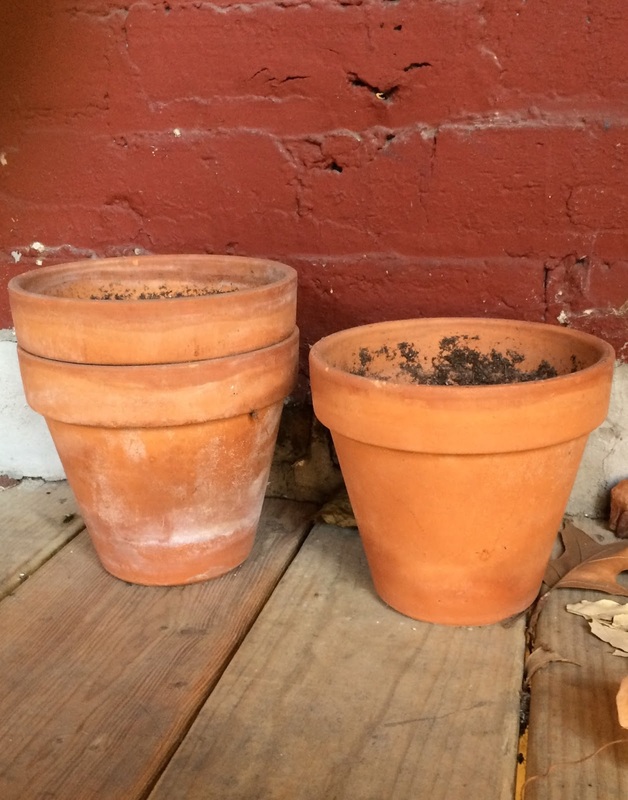 This project takes these boring terra cotta pots from drab to fab for very little expense. Ok, it’s time to get started on creating your own! 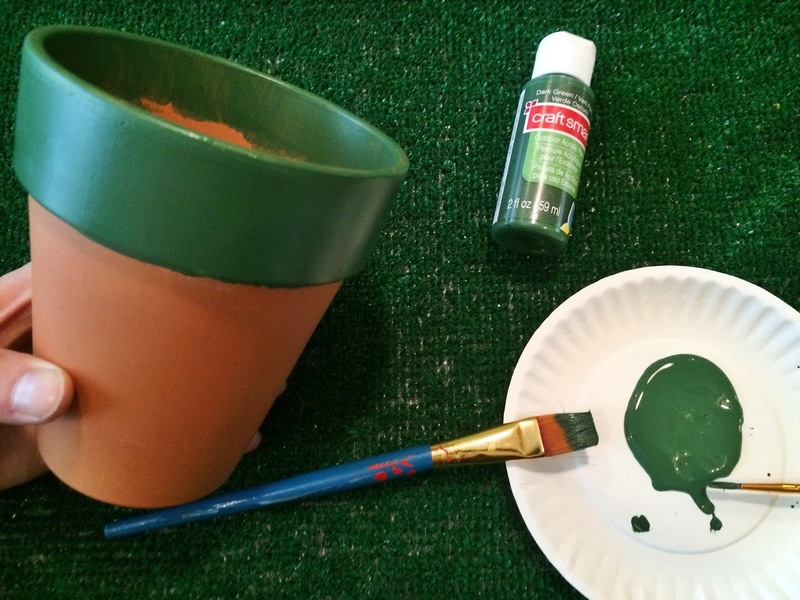 First, paint the top portion of your terra cotta pot dark green. Let dry. 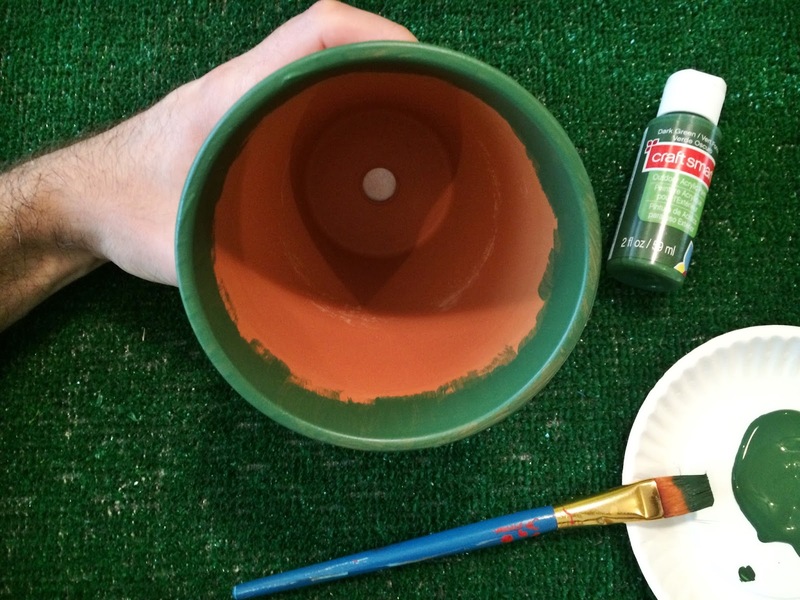 I also painted partially down the inside my pot. That way, once filled if the dirt doesn’t quite reach the top the terra cotta color won’t show. 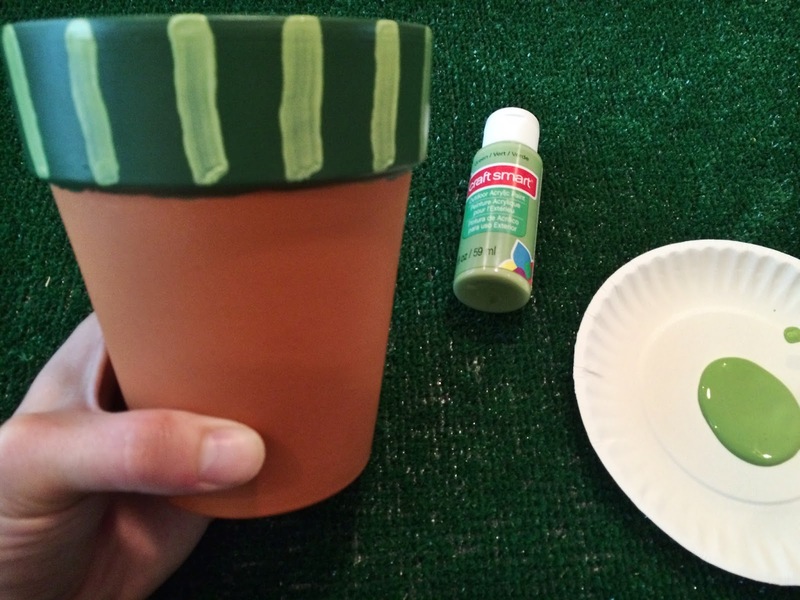 Next, begin painting on vertical light green lines from the top of your pot to the bottom of the lip. Space them out as evenly as possible. Work your way around the whole pot. 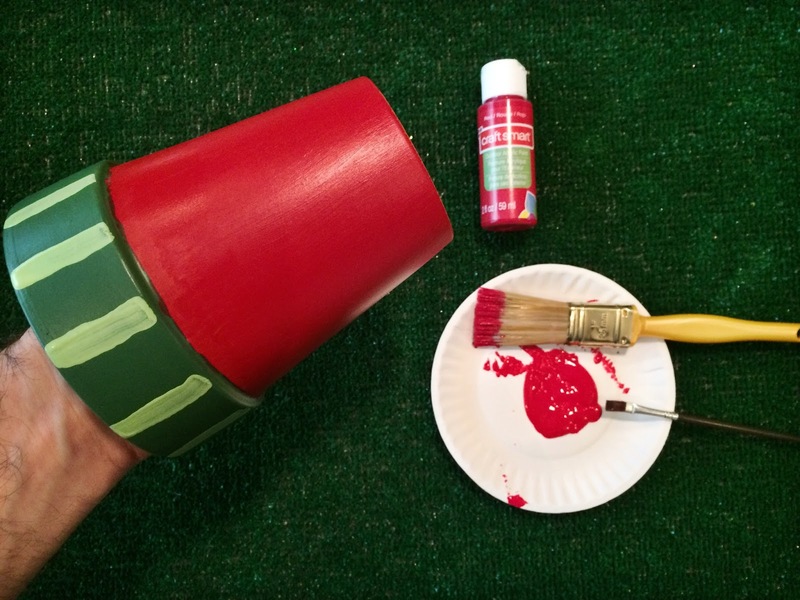 Paint the bottom portion of your pot red. It helps if you place your hand in the pot while painting and rotate your arm as you go along. Let dry. 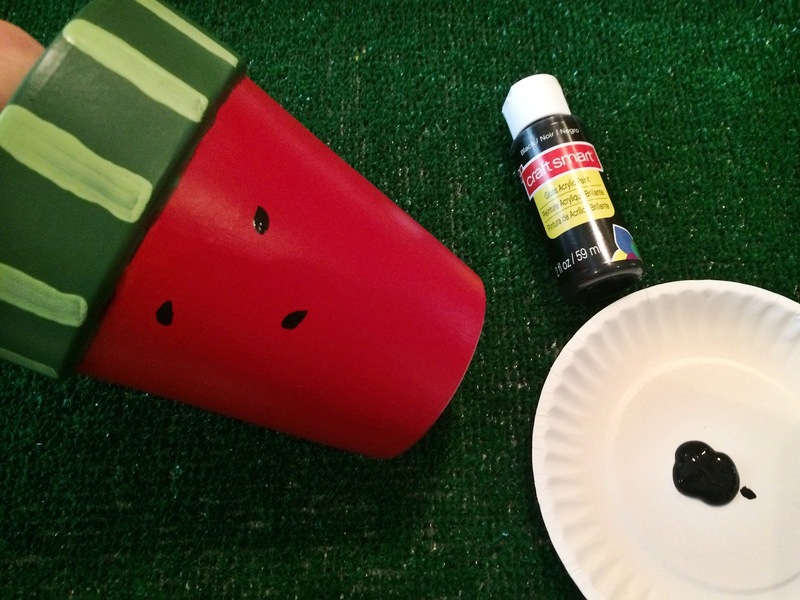 Finally, using a fine tipped paint brush begin to paint on black teardrop shaped seeds at random. 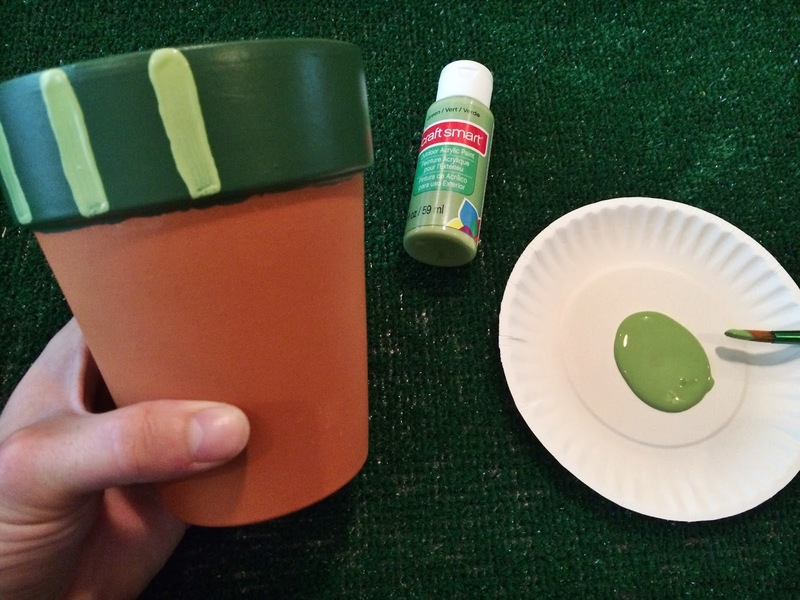 Continue painting on seeds until the whole bottom portion is covered. 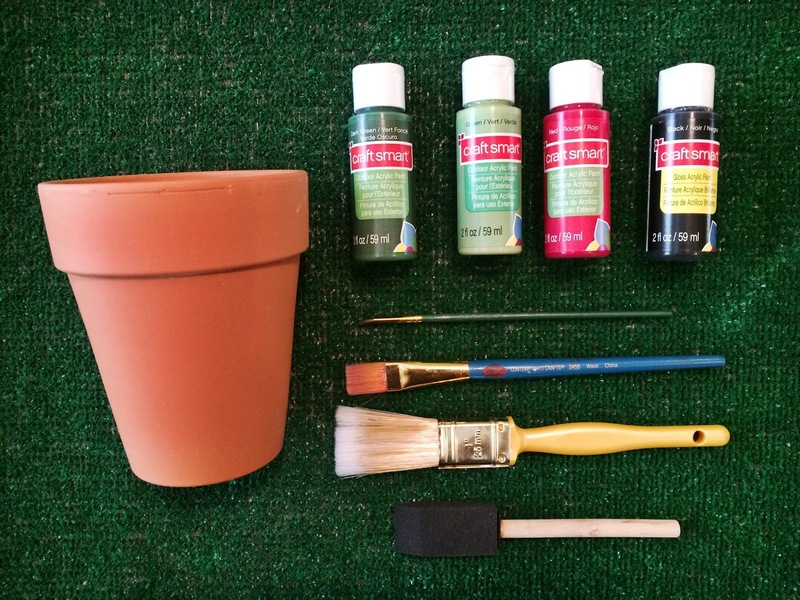 If you purchased a terra cotta pot base, paint that as well. I chose to paint mine light green. 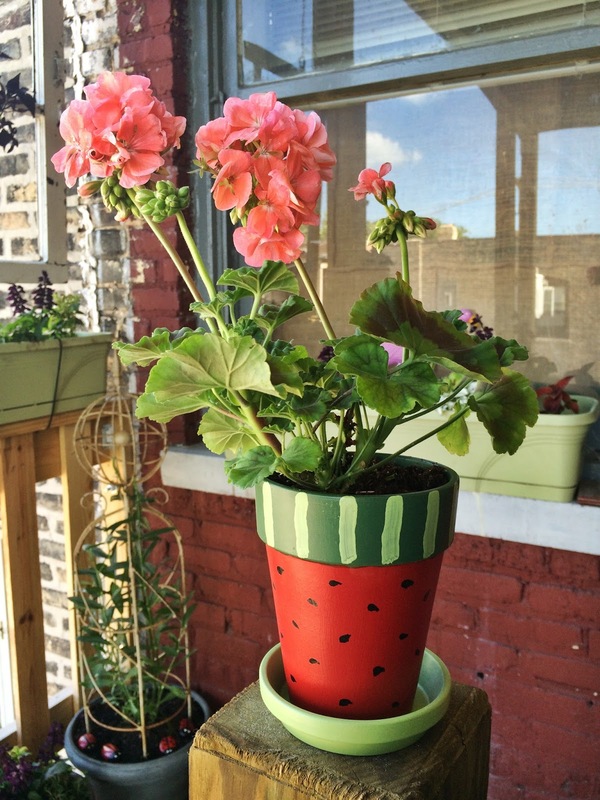 I like how it compliments the lines at the top of the planter. You could also paint it red with seeds to camouflage it if you prefer it not stand out. 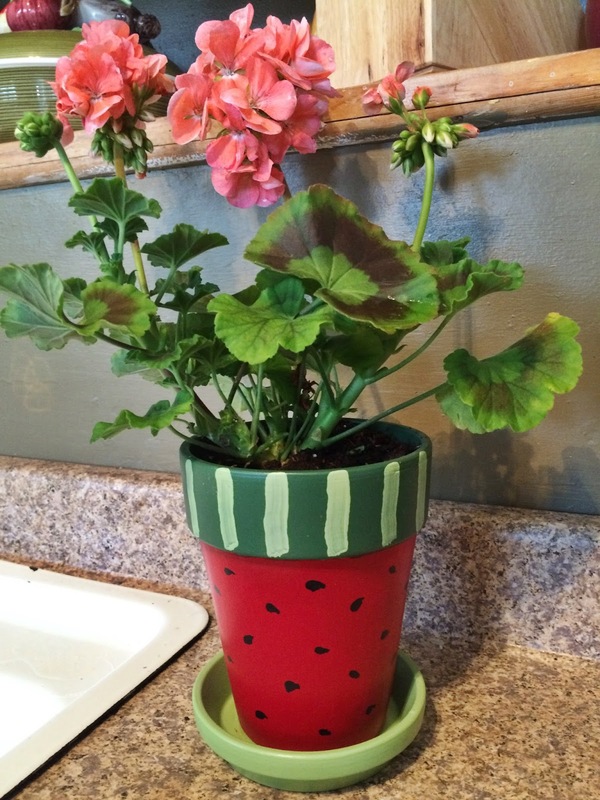 I think the watermelon pot looks great pictured here in the kitchen. 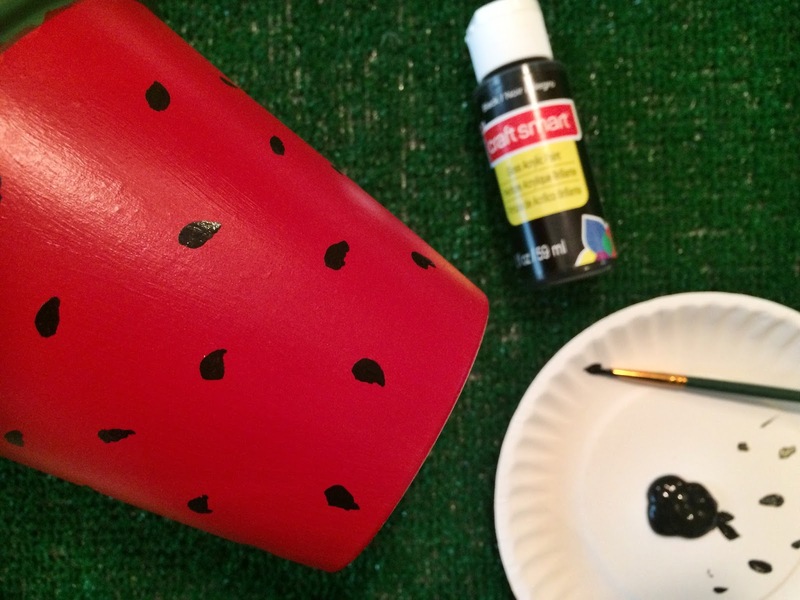 If you paint a watermelon pot for your own or have created any of the crafts featured on this blog, I’d love to see them! Please send them to slumberingalligator@gmail.com. I’ll post them on the Slumbering Alligator Concepts Facebook page. You can view that page here- www.facebook.com/slumberingalligator. And, while there feel free to give us a “Like”.